Includes 1 dozen roses in your room, 1/2 dozen Swiss chocolate truffles and a bottle of chilled beverage of your choice. Complete with 2 special Camas Hotel champagne glasses to keep as a romantic souvenir. (Options include : chardonnay, champagne or non-alcoholic cider. Enjoy a toast with a chilled beverage of your choice, plus 2 Camas Hotel flutes with gold lettering to keep as a souvenir of your romantic getaway. If you have any special requests, or add-on's to your packages, please contact our front desk staff. Please let us know your arrival time so we can be sure to chill your beverages. To add a Special Package, just book your room online and you can add certain packages to your room. Enjoy a growler and 2 Camas Hotel Pint glasses. Also a coupon to Caps n' Taps where you can get $1 off your growler fill! And all day happy hour! Please ask your front desk agent where Growlers may be filled. The Camas Hotel is not permitted to sell growlers that have been filled. Sorry! There are no current discounts or Camas Hotel promotions at this time. 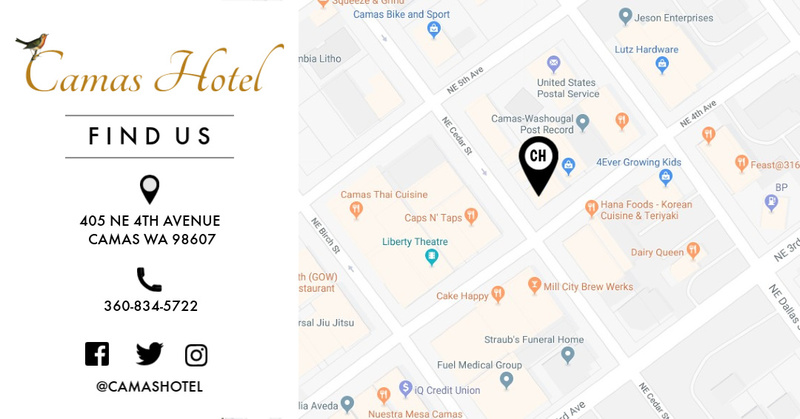 Please follow or like us @CamasHotel on Facebook, Instagram or Twitter for updates! Or sign up for our newsletter!